o Besides the above mentioned activities, the State Rules require following activities to be taken up by the SMC. o Communicate to the local population, the rights of the child and role of State Government, local authority, school and parents as enunciated in the Act. o Ensure enrolment and continued attendance of all the children from the neighborhood. o Bring to notice of the local authority any violation of rights of the child, in particular physical and mental harassment of children, denial of admission and timely provision of the free entitlements. o Monitor maintenance of the norms and standards in the school, as prescribed in the Schedule in the Act. o Monitor the identification and enrolment of, and facilities for learning by children with special needs and ensure their participation and completion of the elementary education. o Ensuring availability of neighbourhood school. o Ensuring admission of children from weaker section, disadvantaged group, children with special needs and children of migrant families. o Maintaining records of the children under Rule 10 of the Right of Children to Free & Compulsory Education Kerala Rules, 2010.
o Ensuring timely prescription of curriculum, syllabus and deciding the academic calendar. o Monitoring functioning of the schools in its jurisdiction. o Providing infrastructure, teachers and their training, special training for children and learning materials. o Ensuring good quality education. The landmark passing of the Right of Children to Free and Compulsory Education (RTE) Act 2009 marks a historic moment for the children of India. For the first time in India's history, children will be guaranteed their right to quality elementary education by the state with the help of families and communities. RTE also mandates the inclusion of 50 per cent women and parents of children from disadvantaged groups in SMCs. Such community participation will be crucial to ensuring a child friendly "whole school" environment through separate toilet facilities for girls and boys and adequate attention to health, water, sanitation and hygiene issues. All schools must comply with infrastructure and teacher norms for an effective learning environment. Two trained teachers will be provided for every sixty students at the primary level. Teachers are required to attend school regularly and punctually, complete curriculum instruction, assess learning abilities and hold regular parent-teacher meetings. The number of teachers shall be based on the number of students rather than by grade. This is a common perception since it is difficult to see beyond the centuries old custom and culture of failing and expelling children. That the learning level of a child who is punished by failure at any time in the elementary stage shall improve the next year has no educational or research backing. If at all, the social stigma of failure, particularly for a child coming from a poor home is more likely to ensure that the failed child shall drop off from the next year. It is a method to weed out children who are harshly judged for being 'weak' or 'dull', which may have a lot to do with the learning environment of the school, the psychological and coping stress on the child, rather than any innate deficiency in the child. More often, failure and expulsion of the child hides the deficiencies of the learning environment of the class room. That is why the CCE, which continuously monitors the learning levels of the child and helps in timely intervention is far superior educationally to annual or board examination based punishments of failure and expulsions. CCE also takes into account the interests, abilities and talents of the child beyond the school subjects that must be recorded while issuing the completion certificate at the end of the elementary stage. Properly implemented, CCE will ensure that children do not advance without learning better than mindless testing of children. Private schools in particular use the failure and expulsion route to weed out what they call 'dull' and 'weak' in order to keep their school brand at a premium to charge more fees. The Act attempts to prohibit this malpractice, which has been upheld by the Delhi High Court decision in relation to a prominent private school of Delhi, mentioned previously. Whose responsibility is it to ensure children, particularly of the disadvantaged groups, are not discriminated against? How will RTE be financed and implemented in India? Central and state governments shall share financial responsibility for RTE. The central government shall prepare estimates of expenditures. State governments will be provided a percentage of these costs. The central government may request the Finance Commission to consider providing additional resources to a state in order to carry out the provisions of RTE. The state government shall be responsible for providing the remaining funds needed to implement. There will be a funding gap which needs to be supported by partners from civil society, development agencies, corporate organisations and citizens of the country. 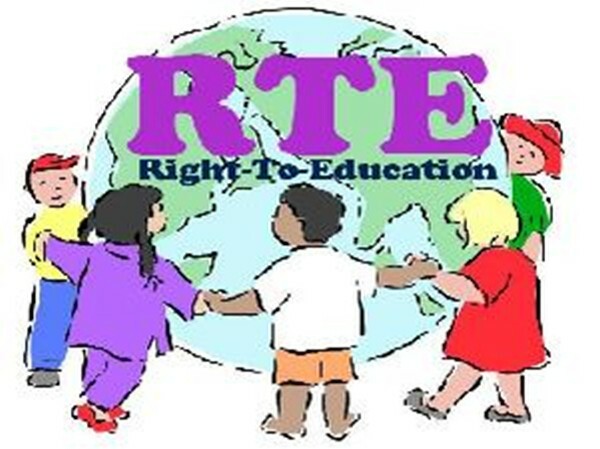 The RTE Act will be in force from 1 April. Draft Model Rules have been shared with states, which are required to formulate their state rules and have them notified as early as possible. RTE provides a ripe platform to reach the unreached, with specific provisions for disadvantaged groups, such as child labourers, migrant children, children with special needs, or those who have a "disadvantage owing to social, cultural economical, geographical, linguistic, gender or such other factor." o Creative and sustained initiatives are crucial to train more than one million new and untrained teachers within the next five years and to reinforce the skills of in-service teachers to ensure child-friendly education. o Families and communities also have a large role to play to ensure child-friendly education for each and every one of the estimated 190 million girls and boys in India who should be in elementary school today. o Disparities must be eliminated to assure quality with equity. Investing in preschool is a key strategy in meeting goals. o Bringing eight million out-of-school children into classes at the age appropriate level with the support to stay in school and succeed poses a major challenge necessitating flexible, innovative approaches. What is the mechanism available if RTE is violated? The National Commission for the Protection of Child Rights shall review the safeguards for rights provided under this Act, investigate complaints and have the powers of a civil court in trying cases. States should constitute a State Commission for the Protection of Child Rights (SCPCR) or the Right to Education Protection Authority (REPA) within six months of 1 April. Any person wishing to file a grievance must submit a written complaint to the local authority. Appeals will be decided by the SCPCR/REPA. Prosecution f offences requires the sanction of an officer authorised by the appropriate government. Substantial efforts are essential to eliminate disparities and ensure quality with equity. UNICEF will play an instrumental role in bringing together relevant stakeholders from government, civil society, teachers' organizations, media and the celebrity world. UNICEF will mobilize partners to raise public awareness and provide a call to action. Policy and programme design/implementation will focus on improving the access and quality education based on what works to improve results for children. UNICEF will also work with partners to strengthen national and state level monitoring bodies on RTE. This article was posted on January 20 , 2014.